If a cinnamon roll and a loaf of brioche bread got together and had a love child while on honeymoon in Slovenia, it might result in this week’s culinary adventure. In the Slovenian-American community, it is the go-to dessert/breakfast item for special occasions. Christmas. Potica. Easter. Potica. Wedding. Potica. Anniversary. Potica. Birthday. Potica. With good reason. This is the stuff of which addiction (and weight gain) is made. 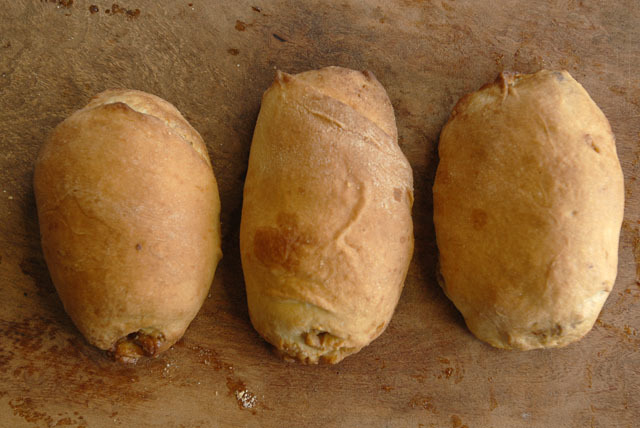 In the version we are preparing for you today, Potica is an enriched yeast dough rolled as thin as the skills of the Slovenian baker allow; spread with butter and a mixture of English walnuts, cinnamon and sugar; drizzled with honey and rolled into a loaf. Is it a pastry? A bread? A cake? The web is awash in debate – at least among the American-born descendants of Slovenian immigrants who see it as their heritage/tie to the mother country. Reknowned Slovenian ethnologist Dr. Janez Bogataj (You’ve heard of him haven’t you?) refers to it as a “cake.” And, while its tempting to let the man who wrote the seminal work on the “cake” – Potice iz Slovenije (Poticas of Slovenia) – have the final word, we feel like doing so would signify that we have given in to the European Union on its Monsanto-esque quest to control food commerce. Say what? European Union? Monsanto? Culinary commerce control? Where did all of this come from? I thought we were talking about a cinnamon roll/brioche love child that might be a bread…or a pastry…or a cake. We are. We will. But nothing is that simple. Let’s call it the Slavic butterfly effect. A stuffed shirt in Slovenia flaps his gums about the need to define and protect Potica. Potica is a cake. Potica dough must be made only with nine specific ingredients. There are only 40 recognized fillings. It must be cooked in a clay or metal cylindrical mold with a circular protrusion in the center. It should originate from a certain region. We need laws. ‘Protect Potica,” is the rallying cry. Give Potica European Union protected food status. Laws are passed. Time goes by. The United States begins recognizing international trade law. The owners of the Rocky Mountain Potica Company in Evergreen, Colorado whose Slovenian family has been making Potica for hundreds of years get a cease and desist letter from the European Union telling them they cannot market their product as Potica because it is baked in loaf form and several of their products such as the “Elvis Wrap and Roll Potica” with its peanut butter, honey and banana filling don’t adhere to the EU’s 40 recognized filling standard. The owners of the Potica company fight the lawsuit, which is joined by Elvis’ estate. Their multi-million empire (built on the food formerly known as Potica) is bankrupted. They reorganize and reopen under the name Rocky Mountain Nut Roll company but the company owners and their children remain more than a little bitter. And not just regarding the business. Their heritage – its preservation and evolution – has been impeached. It sounds a bit ridiculous, but is it really that far-fetched? Three European Union schemes of geographical indications and traditional specialities, known as protected designation of origin (PDO), protected geographical indication (PGI), and traditional specialities guaranteed (TSG), promote and protect names of quality agricultural products and foodstuffs. They are based on the legal framework provided by the EU Regulation No 1151/2012 of the European Parliament and of the Council of 21 November 2012 on quality schemes for agricultural products and foodstuffs. This Regulation (enforced within the EU and being gradually expanded internationally via bilateral agreements between the EU and non-EU countries) ensures that only products genuinely originating in that region are allowed to be identified as such in commerce. The legislation first came into force in 1992. The purpose of the law is to protect the reputation of the regional foods, promote rural and agricultural activity, help producers obtain a premium price for their authentic products, and eliminate the unfair competition and misleading of consumers by non-genuine products, which may be of inferior quality or of different flavour. These laws protect the names of wines, cheeses, hams, sausages, seafood, olives, olive oils, beers, Balsamic vinegar and even regional breads, fruits, raw meats and vegetables. Do these measures protect food heritage? Corner the market on the food product’s commercialization? Both? Who decides when a food item’s evolution stops or whether/when it is entitled to be called by a specific name? Courts and governing bodies? In the case of Potica, we hope that the hundreds of thousands of Slovenian-Americans who have developed a food heritage over the last couple of hundred years and might not fit exactly into Bogataj’s metal or clay mold will be considered. 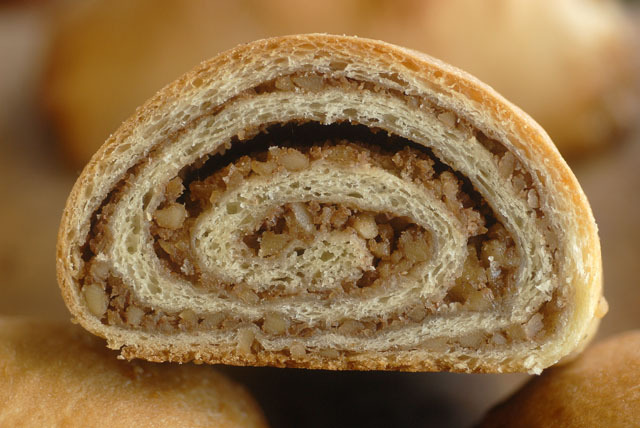 Regardless, we’ll continue to eat the Slovenian-American sweet and savory versions of Potica and call it by the name it earned at the hands of grandmothers who handed the food tradition down to subsequent generations. The recipe that follows may or may not be Potica. 2. In a large mixing bowl, cream butter with remaining sugar (beat 2-3 minutes until light and fluffy) on a medium setting on your mixer. Add egg yolks one at a time, beating after each addition. Add the reserved yeast mixture, remaining milk, 4 cups of your flour and the salt. Mix using a rubber spatula until there are no white flour spots and a dough begins to form. Add the remaining flour a half cup at a time. Turn the dough onto a lightly floured surface and knead until smooth and elastic (8-10 minutes). 3. Lightly grease a large bowl. Place the dough inside. Cover with a damp cloth. Leave to rise until doubled in volume (about 1 hour). 4. Make sure your walnuts are finely chopped (use a food processor) or they will tear the dough when rolled. Combine them with the sugar and cinnamon. Reserve. 4. Place parchment paper on two cookie sheets. Remove dough from bowl, divide into four equal pieces. Place one piece of dough onto a lightly floured pillowcase (or if you think you can keep it from sticking – a lightly floured countertop). Roll it out into a rectangle that is almost twice as long as it is wide and 1/4-inch or less thick. 5. Spread 2T of melted butter across the rectangle, making sure that it is well-covered. Use more if needed. Spread almost two cups of the filling across the dough. Drizzle the filling with 1/4 cup of warm honey. Begin rolling from width (not length) as you would a jelly roll. Every two turns prick the dough with a fork. Pinch the ends closed and place seam-side down on the prepared baking sheet. 6. Bake for 25 minutes or until the top is golden brown at 350-degrees fahrenheit. Internal temperature should be 180-200 degrees depending on how well done you like your dough. 7. Remove. If possible, allow to cool before eating/slicing. Some folks say day old Potica is the best because the filling has more opportunity to permeate the dough/bread/cake/pastry. This entry was posted in Culinary, Food and tagged baked goods, Breakfast, brioche, cinnamon rolls, dessert, potica, recipe, slovenia on July 17, 2015 by Out of Abilene. ← Alfajores. One dulce treat. ahh my friend is SLovenian- def need to make this for her- thanks so much for the recipe and dropping some knowledge on me! we hope you (and your friend) enjoy it.